Oh no. Oh Sweet Merciful God, no! I ran into this item over at BoingBoing, and I died. From laughter. I've sent my spirit, my anima, back to earth to post a link to this, that my friends and colleagues may also perish from hilarity and join me in the Land of Wind and Ghosts. So we can start a volleyball team. Okay, this is from Rahoi.com, from his post of March 2nd (May I Take Your Order). 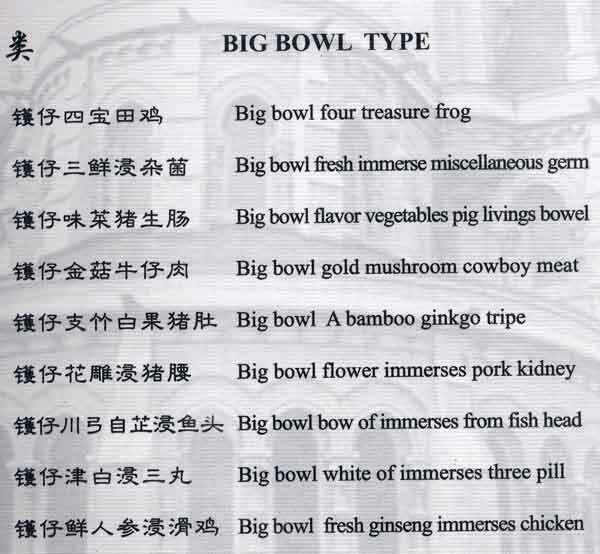 A hideously translated menu couldn't be that funny, could it? I'm not trying to say I've never created hilariously bad translations with internet language dictionaries. Quite the opposite. I am, however, trying to say that things are damn funny. Last night was a hard night. Actually, the whole day was kind of the pits, which is why we went hiking in Muir Woods. I'm a little sick of thinking about it, so here's the short version: the Balazs Committee, which is sort of in charge of Starr King's visiting Transylvanian scholarship program, decided to offer a program next year that would send an American Starr King student to Transylvania for six months to experience the life of a Taransylvanian village minister. Sarah and I applied and felt really really good about our chances. The committee met yesterday morning, and we couldn't take the tension of waiting around to hear the news so we went for a ten mile hike. We met with one of the selection committee members last night, and got the bad news: they awarded the internship to a third-year student at school. A big bummer, but it could be worse! And there may very well be a next year. Muir Woods is where, on May 19, 1945, leaders from all around the world met to sign the charter that created The United Nations! This (in my opinion) incredible salient and significant bit of triviana is totally absent from the website I linked to below, and appears only scantingly in the official US Parks Services website. Go figure. Sign of the times, or accurate reflection of the UN's political significance? I leave it to you, gentle reader, to determine the truth. Sarah and took the day for a hike in beautiful Muir Woods National Monument, just a bit south of her old San Rafael stomping grounds. I don't have any Wednesday classes, and we both needed to blow off some steam. Seriously. Thank you, Garrick! And expecially thank you Matt Bors, for this awesome comic! And that earthquake last hour was weak! We didn't even feel it up here! Weak earthquakes are worse than no earthquakes at all! All my friends in California have this website linked on their bookmarks. A neat way to keep up on the latest earth-shaking action! Trying to flex my brain.